All three bedrooms boast window views of Lake Cay and the entire unit is recently refurnished and decorated. With a sleeper sofa in the den you can comfortably sleep nine making this perfect for large vacationing families or groups attending a convention. There is a formal dining space and a lovely dining table on the patio as well. The kitchen is fully equipped with everything you need to prepare a full meal. The unit also has a full sized washer and dryer for your convenience. Enjoy all the comforts of home while enjoying a luxury Orlando vacation! The master suite has a king bed, as does the second bedroom, while the third bedroom has two full beds. Each bedroom has its own flat screen TV and wireless internet is available throughout the unit. 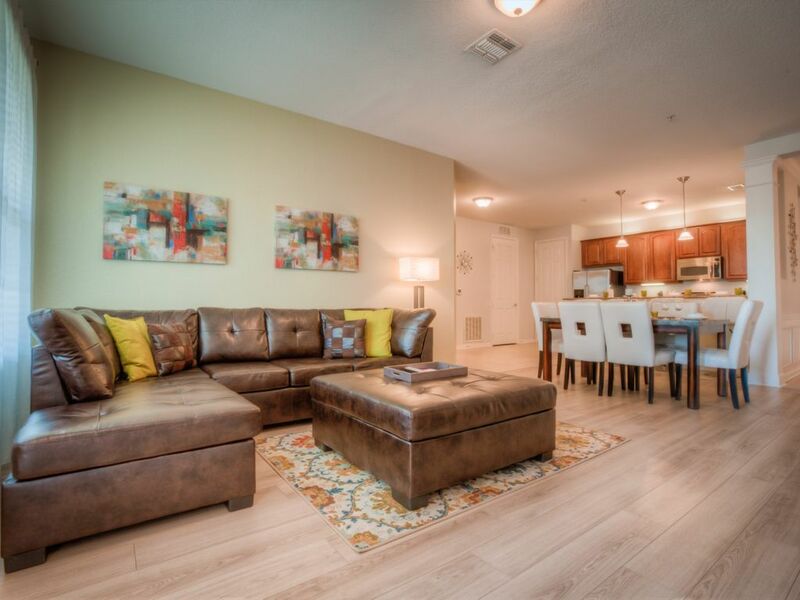 Every detail is attended to in this stunning condo, and you'll enjoy every moment of your Orlando getaway.